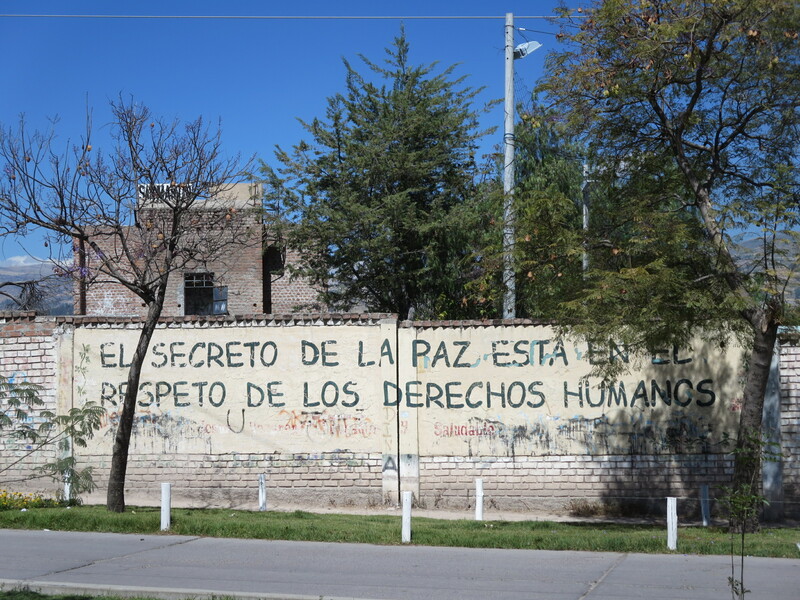 Chasing Rebels in Southern Peru « Why did you click here? Ayacucho is a place most travelers to Peru don’t wind up visiting. 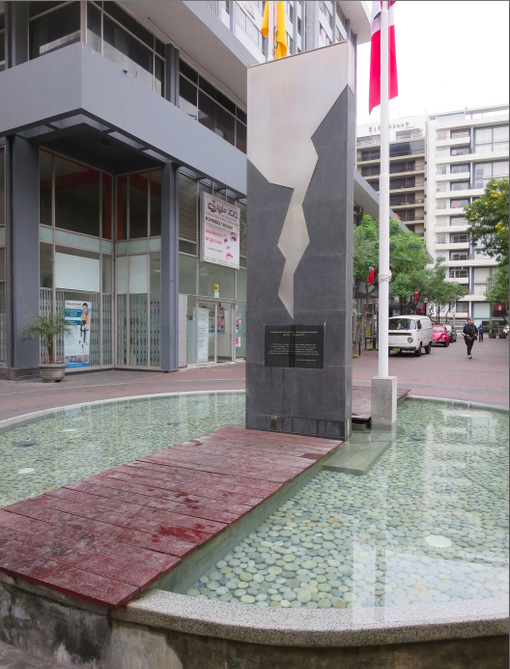 It served as the epicenter of Peru’s battle with domestic terrorism in the 1980s and 90s, and the home of the Shinning Path. It is also reportedly one of Peru’s poorest and more indigenous regions, an oft-cited incubator for the insurgency. It was for these reasons that despite the looming prospect of a 16-hour non-direct, decrepit night bus along windy mountain roads, I insisted we make our way to the town in between the journey from Cusco to Lima. I wasn’t sure what we’d find or even what I was looking for, perhaps I was just curious to set foot in a place I had remembered from childhood time spent watching the news (Saudi Arabia often lacked for viable young-people entertainment in the early 90s – or maybe I was just a dork. Both perhaps?). Upon arrival, the city itself did not appear to us to be struggling, but rather sufficiently recovered from whatever transpired 20-30 years ago. A few decades can make a huge difference, I surmised, while some public works projects were active. 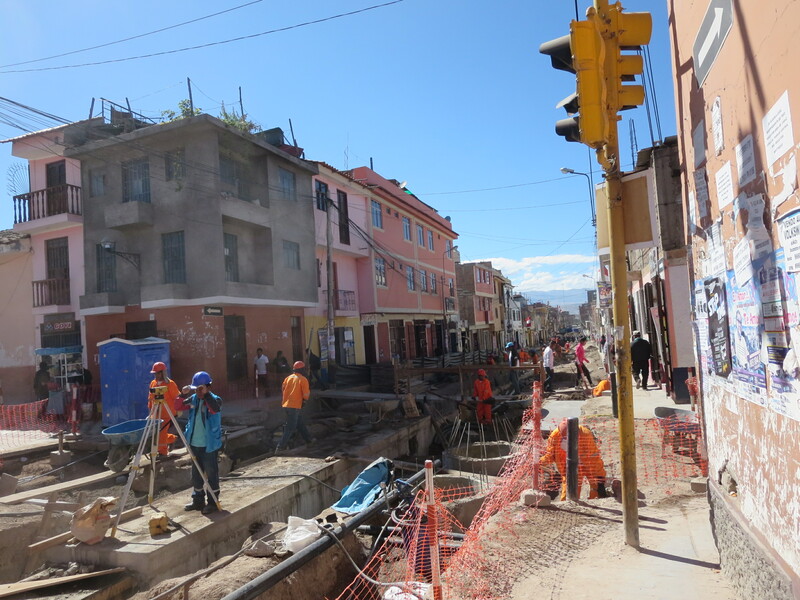 In fact, the vertigo-inducing 16-hour journey to get there from Cusco was actually an improvement, as a new road and repaired bridges last year cut down the travel time from 28 hours. In addition, the roads of the entire town were under construction, part of a project to provide better drainage during rainy periods. Perhaps just part of Peru’s larger road-specific development aspirations – or perhaps more due to a special focus on this region to deter support for Shinning Path remnants now largely involved in the cocaine trade along the Brazilian border? Who’s to say (well someone probably, but not me nor anyone I met during our 72-hours in the town). 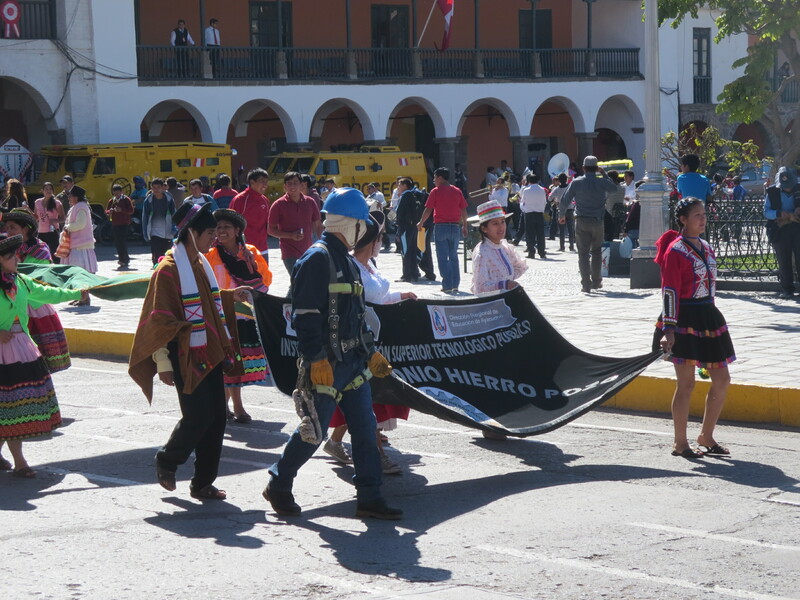 People feel safe enough to put on seemingly daily parades, as everywhere in Peru! Nonetheless, we did notice some evidence of gloomier times. We came across a large poster advertising a new political party by the name of Movadef, a coalition grouping which may or may not be linked to the Shinning Path’s continuing political arm. 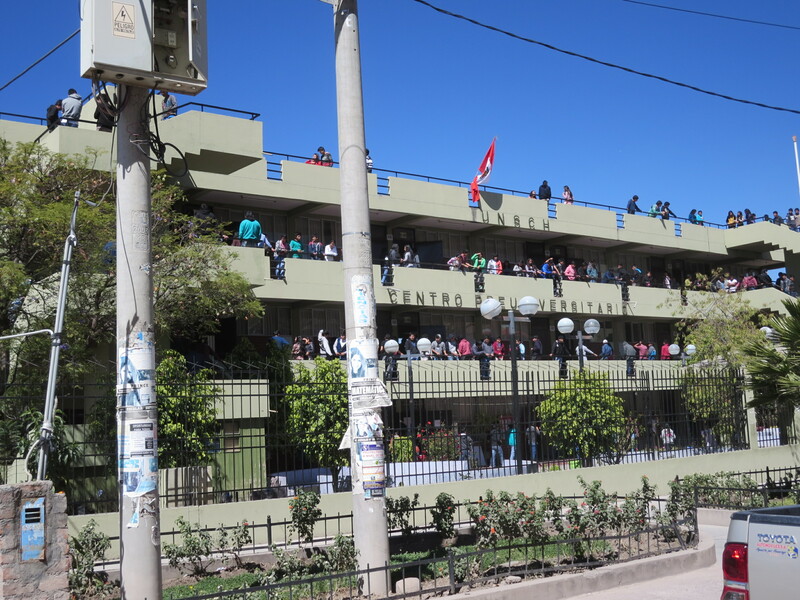 The Peruvian Government has previously rejected the party’s registration, ostensibly for that reason, but volunteers were still there collecting signatures for another attempt. An old man approached us and explained, “the United States thinks we’re a bunch of terrorists, but we just want our rights – people are working 10-hour days and still not making any money.” A seemingly legitimate demand, we bid him good luck and made on our way. 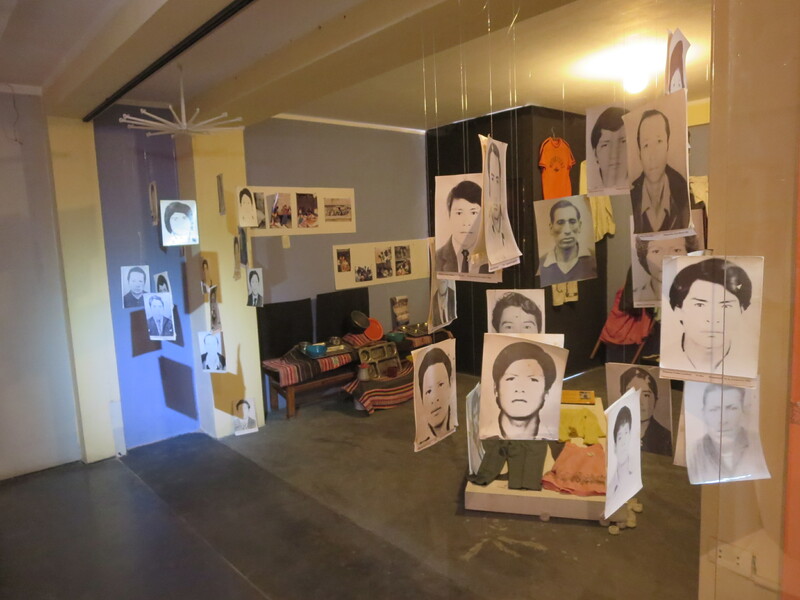 One of our next stops was the Museo de la Memoria, or a memorial museum set up by the family members of some of the victims of the violence, both those killed by the Shinning Path and the government. The museum, small but brimming with information, served as the most vivid reminder of what used to transpire in Ayacucho and the surrounding region. The lady running the show there explained to us that the new political party “is somehow linked to the Shining Path’s ideas but different,” without delving further specifics before essentially shutting that conversation down. Perhaps some things are still best left for a more discrete conversation. From the museum, it’s just a short walk to the Universidad Nacional de San Cristóbal de Huamanga (UNSCH). It was here where the Shinning Path had its origins, stemming from the teachings of philosophy professor turned guerilla leader, Abimael Guzmán. A normal looking university, we walked through its grounds surrounded by hoards of fashionable young students occasionally looking up from their smart-phone technology to register a non-Internet related thought. I was curious to ask to see the philosophy department specifically, but we (re: Christine) decided against it. The story of the struggle is not confined to Ayacucho despite the Shinning Path’s urban beginnings, as significant activity occurred in the surrounding countryside. Thus, we took a day trip to visit some nearby ruins and a small town. Along the way one woman complained that “nothing is changing here despite what the President is saying about malnutrition rates and education – maybe in the cities it is getting better, but not here in the rural areas,” a reaction that perhaps answers a bit of the question regarding how the rest of the province has fared since the culmination of violence in the 1990s. Sevetny-two hours in an area, especially one in which I only had a cursory background in, is not sufficient to make any sweeping conclusions, but that won’t stop me. I don’t know what Ayacucho was like before, but I do know it would’ve been near impossible to visit this region twenty to thirty years ago for foreigners concerned about long-term survival. It is perhaps in this that I took away the greatest lesson from the short detour off our otherwise obliviously happy trip. Given that the vast majority of my professional focus revolves around areas currently ravaged by the sort of terrorism and conflict that used to afflict Ayacucho, it’s more than a little encouraging to visit a place that has been able to reduce such concerns to history. It’s an optimistic reminder that despite the seemingly intractable violence in locations such as northern Nigeria or south-central Somalia today, this can be a blip on a longer-term time horizon, as Ayacucho, albeit under extremely different circumstances, has demonstrated. That optimistic lesson in itself is enough of a reason to make the 16-hour journey, vertigo and all!